3. Made by permanent magnet, require no power supply, thus eliminating hazards due to failure wiring system as electric type. 4. 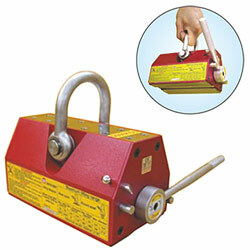 It features powerful magnetic force, with 3.5 times safety coefficient makes more safety in use. 1. Applications: suitable for move plate steel, block steel and round steel, such as machine parts, press molds, plastic molds and iron material .....etc. 2. Operations: with ON/OFF switch, it is very easy and convenient to operate.